» Articles » Sharp Tips » Do Tulips Come Back Every Year? Is there a more brilliant sight in the world than the bright deeply rich colors of tulips blooming in the springtime? Probably not! Once you add tulips to your home gardening landscape, you’re hooked. And the grandeur and brightness they add to your surroundings make you want to keep those colors coming back year after year. But is it enough to plant strong healthy first-quality tulip bulbs into your garden and think that you’ll get the same top notch show of blooms every spring from now on? Seems like that should work, doesn’t it? After all, tulips are bulbs and they do survive all winter under the ground and they do make and store their own food for the next season’s growth--right? Here’s the short answer--yes. Tulips are bulbs and they will continue to produce some top foliage and some blooms in the years following their initial planting into your garden. However------the top foliage will not be as dense and as lustrous and the blooms will not be as large, healthy, or plentiful in the years after their first appearance, even though there are some steps you can take to help them along. If nothing else is done to your tulip bed after the first planting, the bulbs will, in time, “play out” and eventually you’ll have little to no springtime blooms and little to no foliage. Here’s how to get the most out of your tulip bulbs. 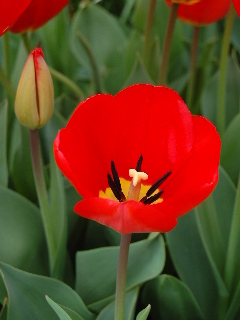 After the tulips finish blooming in the springtime, cut off the bloom stalks but allow the foliage to remain until it turns brown before cleaning up the site. In the fall, add more bulb food or “super-phosphate” to the soil surface, water thoroughly to help the fertilizer move down into the soil to feed the bulbs, and mulch the site well to prepare it for winter’s sleep. Here’s an analogy to keep in mind--even the finest automobiles and the best air conditioners and washing machines eventually need to be replaced. And, sadly, even healthy old oak trees don’t last forever. Such is also the case with tulip bulbs. So, while tulip bulbs will come back from year to year, their vitality will decline with the passage of time. Even with your very best gardener’s efforts, it’s still a good idea to replace your tulip bulbs every few years with a fresh planting of new top-quality bulbs.